Because the number of things had increased because of the move etc. , the chest that became a bookshelf to arrange the measuring instrument, parts, and books was made from woodwork. A cheap, strong, practicable shelf was able to be made from a minimum processing by using the SPF material. It is a chest that the shelf at the right of this photograph produced this time. It is a size of about 900mm in width, about 1800mm in height, and about 290mm in depth. About 350mm of the shelf was intervals of the shelf board by five steps. The SPF material of 1x4 and 1x6 was chiefly used, and the plywood of 11mm in thickness was almost used by unprocessed for the scaleboard. 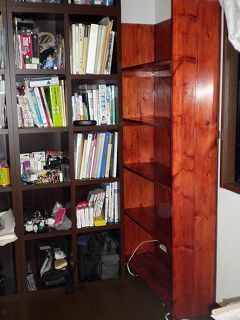 The bookshelf that there is 712mm in width and 295mm in depth height in this place up to the ceiling has already arranged 2 pieces and it is set it up. The space of about 350mm x 920mm had become empty in the next of that. It wanted to use this space effectively, and the chest was produced. The purpose is to make it not become obstructive for spouting the wind because the air conditioner will be set up here by there is most little or nothing a shelf on in the future. The outlet etc. were able to be used for this part by making the scaleboard the hole of 140mm square because there were AC100V outlet etc. in the corner of the room. Painting used three varnishes of the walnut color bought in the hundred-yen storen. I think it becomes darker while using it though I wanted to make a little darker color. Still, there is weight compared with a thing on the market because it uses the tree with the thickness. After it even had painted with the shelf board had been removed, I carried to the installation location. The shelf board installed it later. Plywood (11mm x 900mm x 1800mm)---One piece is used as it is as a scaleboard. All SPF 1x4 does half in length completely. This is used as receiving the shelf board. The number of things of 280mm in length is 10, and five things of 822mm in length are necessary. SPF 1x6 is used as both sides and shelf boards. The number of things of 861mm in length is 10, and four things of 1800mm are necessary. The price rises very much though it is easy if SPF 1x12 is used. It is possible to do even if SPF 1x4 is used if it makes it to cheapness or more. First of all, a side board is assembled. Two pieces tie sideways and the board of 19mm x 140mm x 1800mm is stopped with the board of 19mm x 43mm x 280mm. The interval of the shelf board was assumed to be about 350mm. This two is made. Next, the hole (140mm x 140mm) for the outlet is made for the plywood. The rim saw was used for this processing. The side board made in the processed plywood a little while ago is installed. The machine screw is stopped from the plywood side. Afterwards, five receiving of the shelf board is installed on the plywood. When two shelf boards are installed in five steps, it is almost completion after this. This is tightened on with the machine screw. Assembly ended very easily. I used the varnish to make the best use of grain though you may paint in the lacquer. A water thing of the varnish is easy and handling is easy. About 700ml was used the walnut color thing.